Sometimes the best stuff has already been dug up. 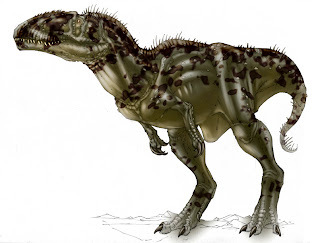 Recently an old specimen (considered a sub species of Chilantaisaurus) has been re-examined and found to actually be a member of the carcharadontosaur family. So it's been renamed Shaochilong maortuensis. This is the first instance of a carcharadontosaur in Asia. It's know from pretty scrappy remains and might actually turnout to be a juvenile, so this drawing it pretty hypothetical. The cool thing is that these animals might have actually feed on primative ceratopsians and competed with early tyrannosaurs. Hey Brett, Steve Brusatte here. I just wanted to compilment you on an excellent reconstruction of the new beast my colleagues and I just described, Shaochilong. Great work! We're writing a full monograph on the taxon and would like a skull reconstruction of the animal. Is this something you may be interested in doing? Please get in touch: brusatte AT gmail DOT com.